You've got to love this almost surreal photo of Chicago Blackhawks captain Jonathan Toews (along with his cousing Madison) lugging the Stanley Cup around Winnipeg last weekend. I was actually fairly certain is was Photoshopped at first, but it turns out it's the real deal. 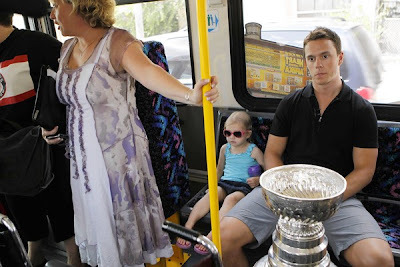 I'm not really sure what I'd do if I saw the Cup on the bus with me, aside from take a photo. The Chicago Tribune has a slideshow of Toews' trip home with the Cup. Check the rest of the photos out, there are some other great shots (like one of Winnipeg mayor Sam Katz casually mowing down a sandwich while the Cup sits on his desk).